the intelligence capable of grasping the whole of truth and knowledge. Alas! how dreary would be the world if there were no Santa Claus! It would be as dreary as if there were no Virginias. There would be no childlike faith then, no poetry, no romance to make tolerable this existence. sight. The external light with which childhood fills the world would be extinguished. Not believe in Santa Claus! You might as well not believe in fairies. You might get your papa to hire men to watch in all the chimneys on Christmas eve to catch Santa Claus, but even if you did not see Santa Claus coming down, what would that prove? You tear apart the baby’s rattle and see what makes the noise inside, but there is a veil covering the unseen world which not the strongest man, nor even the united strength of all the strongest men that ever lived could tear apart. 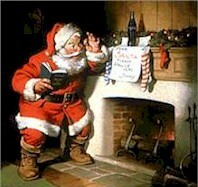 Francis P. Church’s editorial, “Yes Virginia, There is a Santa Claus” was an immediate sensation, and went on to became one of the most famous editorials ever written. “Quite naturally I believed in Santa Claus, for he had never disappointed me. But when less fortunate little boys and girls said there wasn’t any Santa Claus, I was filled with doubts. I asked my father, and he was a little evasive on the subject. so,’ and that settled the matter. “ ‘Well, I’m just going to write The Sun and find out the real truth,’ I said to father. And so Virginia sat down and wrote her parents’ favorite newspaper. motto, “Endeavour to clear your mind of cant.” When controversal subjects had to be tackled on the editorial page, especially those dealing with theology, the assignments were usually given to Church. controversial matter, and he was burdened with the responsibility of answering it. “Is there a Santa Claus?” the childish scrawl in the letter asked. At once, Church knew that there was no avoiding the question. He must answer, and he must answer truthfully. And so he turned to his desk, and he began his reply which was to become one of the most memorable editorials in newspaper history. principal. After 47 years, she retired as an educator. Throughout her life she received a steady stream of mail about her Santa Claus letter, and to each reply she attached an attractive printed copy of the Church editorial. Virginia O’Hanlon Douglas died on May 13, 1971, at the age of 81, in a nursing home in Valatie, N.Y.